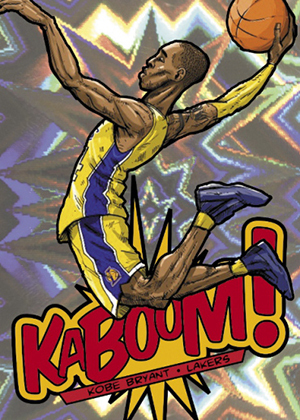 If you collected basketball cards back in the 1990s, wild designs and creativity were musts in virtually every release. Some ideas worked. Others were laughed off and disappeared into hobby obscurity. 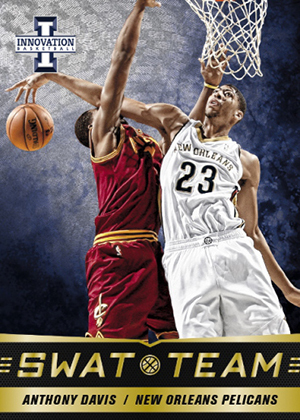 It's too early to say which side 2013-14 Panini Innovation Basketball falls on, but it certainly isn't dull. Each box has six cards, half of which are hits. Collectors will find two autographs and one memorabilia card. The other half of the cards are the inserts, all of which aim to be distinct. 2013-14 Panini Innovation Basketball has several levels of signed cards. Top Notch Autographs have a die-cut design and are numbered to 325 or less. Both these and Foundation Ink (#/199 or less) have Gold parallels numbered to 25 or less. Main Exhibit Signatures and Main Exhibit Rookies Signatures are highlighted by on-card signatures and a shadow box design. Stat Line Jerseys (25 cards) return with game-dated memorabilia. Other relics include Rookie Jumbo Jerseys (25 cards) and Memorable Memorabilia (50 cards). All of these are numbered to 299 or less. They also have Prime versions that have no more than 25 copies each. Autographed memorabilia sets include Game Jersey Autographs (50 cards) and Digs and Sigs. Besides basic versions, both have Prime parallels numbered to 25 or less. 2013-14 Panini Innovation Basketball doesn't have a base set. The closest things are the 75 View and 25 Rookie View cards that have a see-through effect. These combine to fall one per box. Base versions are numbered to 199. Parallels include Blue (#/25), Gold (#/10) and Black (1/1). Each box also has one Stained Glass insert. Boxes wrap up with one additional insert that mixes big designs and rarity. These include All Rookies (15 cards), Juggernauts (30 cards), Starters (30 cards), Starters Legends (10 cards) and Swat Team (15 cards). Kaboom! 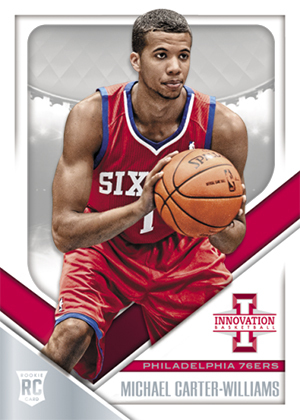 (20 cards) are the rarest basic inserts in 2013-14 Panini Innovation Basketball. A case hit, these have a bursting foil background and a comic-like illustration. Leading up to the set's release, Panini announced special packs with exclusive Purple View and Light Blue Stained Glass parallels. 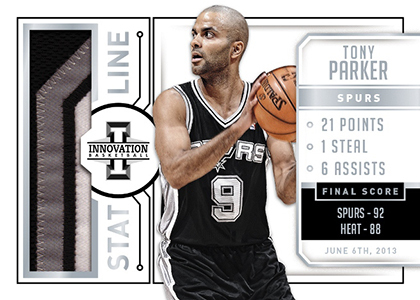 Packs of five cards were offered with each case of 2013-14 Panini Innovation Basketball. I really liked the “Clear View” cards from 12-13 and will be looking forward to see how these look. 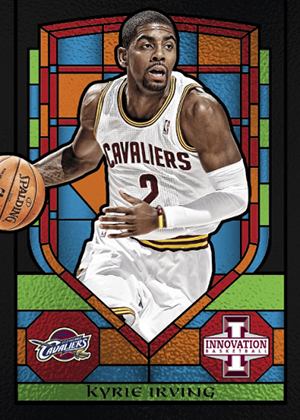 I already like the Stained Glass insert design better than last years. If Panini would put out low end packs(cheap and in retail stores)with cards that look like the Kaboom insert…they would probably bring in lots of young collectors who otherwise will probably never see(let alone own) a card like that! Why put that in a “Mid- to High-End Basketball Card” set? like there was in the 90s. With the so called ‘promos’, there will be more cards to chase. From a personal perspective, I don’t care for the comic book Kaboom cards. I wish for the case hit that Panini would have done something less juvenile and more sophisticated. I agree with Hallco that this set would have been better off in a lower end product so kids had accessibility to Kaboom. and I hope they are realistically obtainable. a step down from last year. it looks like Panini is slightly imitating here. That’s great, but be bolder! the product for years to come. I reckon this product is more skewed to a high end product. Is it worth it? It depends if you got a Lakers, Celtics or Knicks in a random box break. The good: inserts are well designed. The one that stood out was the starters. Imagine if Panini improved this with championship teams from 2000 up to present. Even for a non-auto or non-memorabilia. That would make people happy in collecting such a product. The bad: one auto per box and your probability of landing a good one is relatively difficult. If you do land a good auto, then good for you. But chances are if you open a case, you can get one that is relatively worth it. Very nice cards. Really enjoyed the variation of inserts. Stained glass, clear view, die cut etc. The on card autos of old greats (although not low numbered) add value to the product. The prime patch cards are of good quality. Veteran patch autographs (non prime) are also very nice. Overall this is a great product.